Hello everyone and welcome to the Digital Delights It's a Celebration Blog Hop 30 June-1 July 2011. This is a 2 day hop to help you get through all 30 of our talented designers, collect your letters and enter to win the grand prize! If you came here from Marlene's Desguised as a Grown-Up blog then you are in the right spot! If you have just come across this posting while browsing around in blog land then start at the top so you don't miss all of the amazing projects! The theme of this hop is CELEBRATIONS!! At Digital Delights by Louby Loo, we are celebrating the new store! Wendy (aka Louby Loo) just completed the move to a new and improved store! In honor of this, each stop along the way will have a Digital Delights stamp from their project to be given away. There are amazing sponsors for the grand prize at the end. This is a hop with a different twist as along the hop there are letters to find in the postings - not all blogs have the letters but if you gather all the letters then at the end of the hop on day 2 assemble them to create a Digital Delights related word. You then return to the Digital Delights blog and enter your name in the inlinks at the bottom of the post (do not reveal the secret word yet). After the hop you will be contacted if you are selected at random--at which point you will be asked to reveal the correct word. 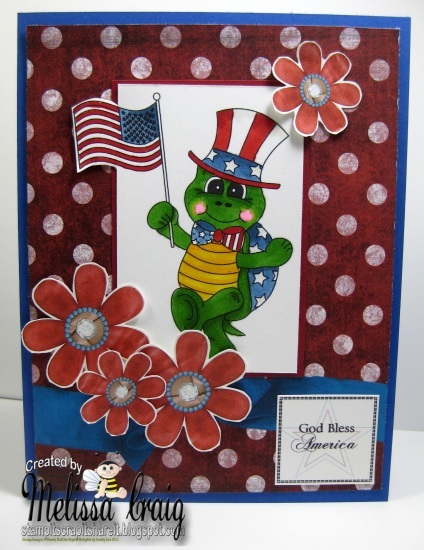 This week's challenge at Digital Delights Challenges is Red, White & Blue and what better way to celebrate the Independence of our country than with fun cards and projects for your greetings and parties. Also, we have another reason to celebrate and that is our very own Wendy is now a US Citizen! Yay Wendy!! So please when you play along, leave a congratulatory comment for Wendy. In order to be eligible to receive this digital stamp, please leave a comment below, become a follower if you fancy. In your comment please provide an email address so that you can be contacted when I draw the prize. Thank you for stopping by! I hope you liked my project. Now back to the hop - I can now reveal my hidden blog hop letter is N. Remember to collect all the letters from the hop and assemble to form a Digital Delights related word then return to the Digital Delights blog to enter. 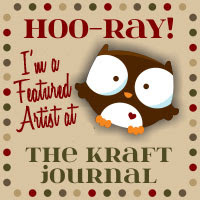 The next stop on the hop is: Nancy's Crafting Passions blog. Good Morning! It's Tuesday, so that means it a new sketch at Tuesday Morning Sketches and guess what!? It's sketch challenge #100!! That means we are just a few weeks away from TMS' 2nd birthday. 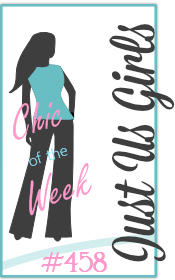 I'm really excited to Stamping Boutique sponsoring us this week - what fun! 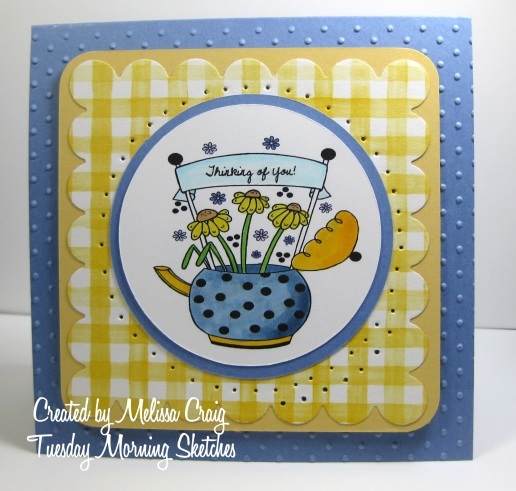 The image featured here is Teapot Banner. What a great image, so me, since I've loved teapots since I was a little girl. I just added a text box over the image to add my simple greeting. I tried making a decorator envelope, but I only suceeded in getting mad and ruining paper. I hope you enjoy card and that you'll play along with us this week. My card features Bucket & Spade Peyton and he's certainly ready to play in the sun - he's even a bit tanned already. 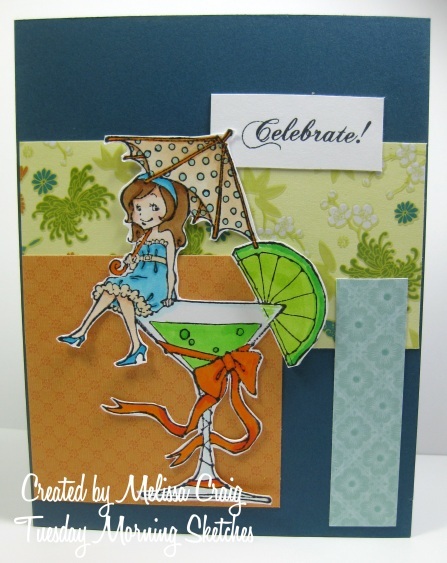 My card layout comes from a great sketch at Sweet Sketch Sunday. I do hope you'll join us this week at Digital Delights, it's a lot of fun!! Good Morning! Hope you had a great Monday. 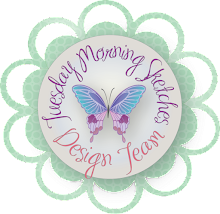 It's another Tuesday and Theresa has designed a pretty fun sketch for us this week. Sparkle Creations is our sponsor and she was sweet enough to share some stamps with us. I'm not super pleased with how my card turned out, but the stamp is cute! Now head on over to join us at TMS. Good Morning everyone! I had such a great time yesterday stamping. I didn't get a lot done - I have no idea how some people can sit down and crank out 20 cards - I did 4 and feel like that's a GINORMOUS accomplishment. So here's a card I made to play along with The Sweet Stop and Crazy 4 Cocoa weekly challenges. The Sweet Stop provided a great sketch for a round card and Crazy 4 Cocoa challenge is to add buttons or brads. I'm also entering this into Crafts 4 Eternity which is to embellishment with the letter R - I have ribbon on my card. 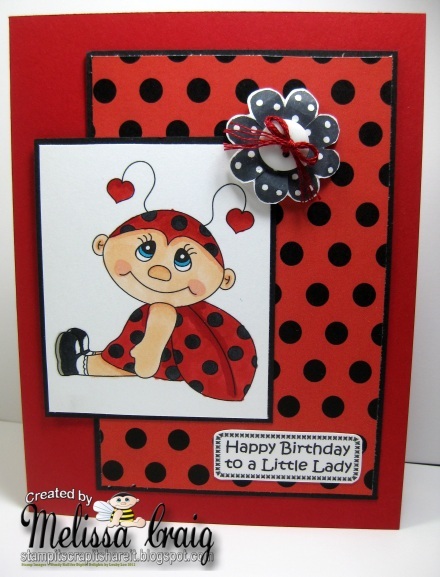 I've used Berry Sweet Cocoa (SNSS) for my focal image and paired it with some great digi paper from Doodle Pantry. I pulled out my Cricut and SCAL to cut the card - it's an SVG by Kristina Werner available from Two Peas in a Bucket. The buttons are white, but this picture makes them look silver. I found some ribbon that I won last year that is just the perfect compliment to this card. Look at those sweet strawberries! Thank you visiting me today - I am so glad you decided to drop by! Good Morning! I hope you're all enjoying your weekend. I spent a wonderful day yesterday with a friend and his children and my children. We did a small cookout and then they played in the pool. And today my children are with their Dad all day, so I have some stamping time. 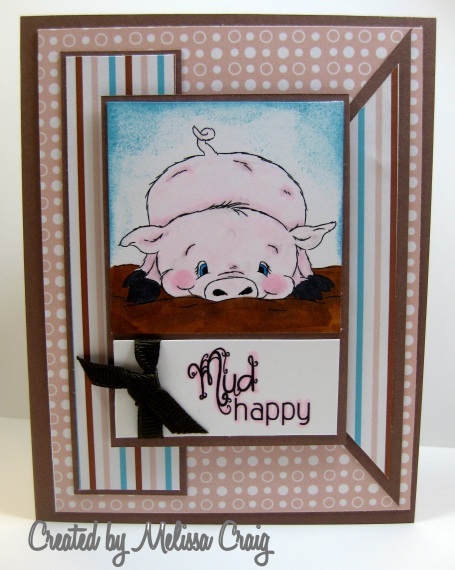 To play along with the sketch, you are not required to use TSG stamps, Jessica and the team would love it if you did, but I also had this too cute pig sitting on my table for weeks waiting to be used, so she went on my card. 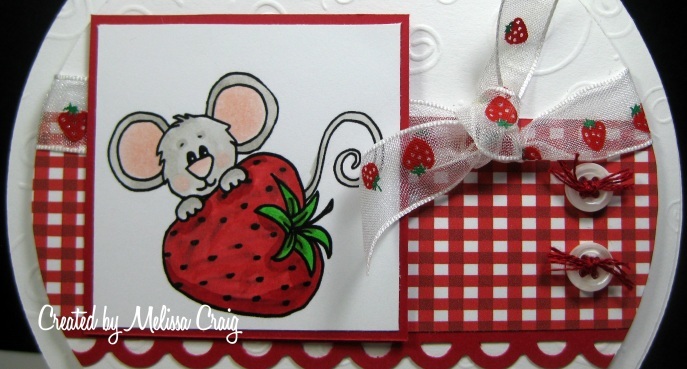 Not that I don't love my TSG stamps, but this sweetie has been begging to be on a card. 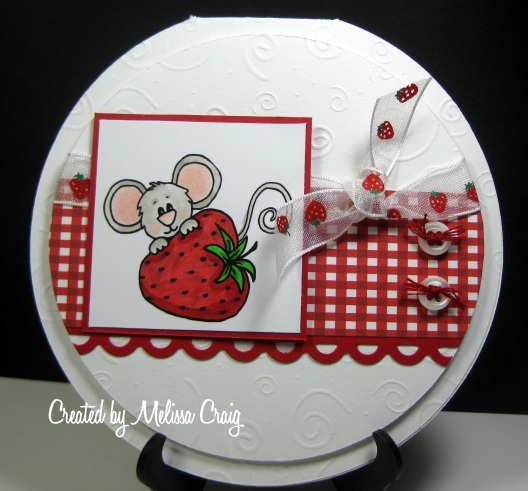 This is Mud Piggy from Doodle Pantry (one of my favorite digi stores) and I'm also entering their challenge which is a theme to use any of Laurie's images. I do hope you enjoy my card. I'm off to go play somemore. Enjoy your day! Good Morning! I hope you're having a terrific week - we're on the downhill side to this one. I'm looking forward to the weekend, I promised the kids a trip to the beach, so hopefully we'll be able to get that in. For this card I used Lara Ladybug for this sweet birthday card, along with the sentiment that goes so perfectly well with her. As I said, it's such an easy challenge to play along with, you should come join us! Thanks for stopping by today, I do appreciate the visit and any kind words left behind. Enjoy your day. I did also play along with The Sweet Stop's sketch challenge. Great layout! Good Morning! 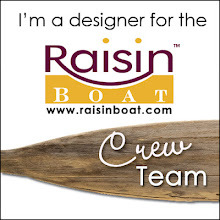 I have had the pleasure of being able to join the Delightful Challenges design team. My sweet friend Jackie suggested it, so I thought, what the heck, I'll give it a try. I've been a follower of Wendy since she first started her little digi store and now it's huge, more and more adorable and I am so excited about this! So the challenge is.... FATHER'S DAY! 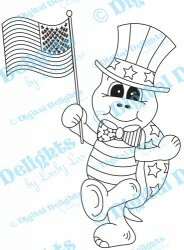 I did use the sketch from Sunday Sketch & Stamp - which happens to be a challenge the Digital Delights is sponsoring. Great sketch to play with. I did omit the embellishments to keep this a CAS card. 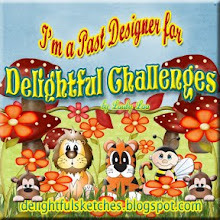 I hope that you join us at Delightful Challenges. Hi everyone! I cannot believe that I completely forgot to set up my blog post for Tuesday Morning Sketches. Where is my head!? So here's my card using Bubble Leah - she's so cute. 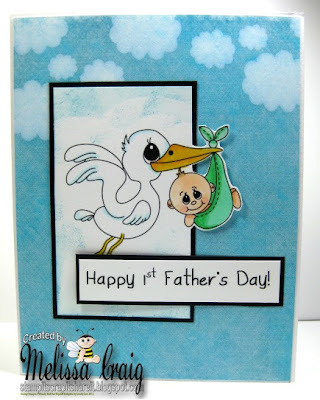 I also used Core'dinations card stock, I love this stuff, it is so cool! I embossed the paisley and then sanded the paper - this is such a neat look.